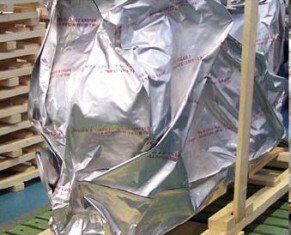 Aluminium film which allows protection of goods in shipments and also isolating the inside of the packaging from moisture. Manufacturing of any size of bags for packaging products. The aluminium foil is a product used to protect the goods from moisture and environmental conditions. It is a suitable solution for the protection and conservation of products over long periods of time. Prevents that the conditions inside the packaging are consistent to avoid materials damaging. On the other hand, the aluminum film has a high mechanical strength well suited for packing products with edges or metallic materials. With easy welding thereof is achieved by clips to produce finished products of any shape adapted to the geometry of objects. 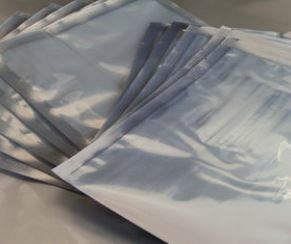 One of the most common uses of aluminium foil is in bags, sacks or bags of certain dimensions that facilitate the packaging of products repeatedly. 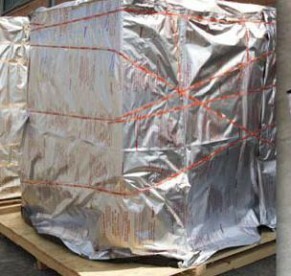 It is thus the perfect solution for shipping goods over long distances by sea or for storing products in the long term. PROPAMETIC a multilayered product and it is obtained thanks to coupling by laminating 3 or 4 technical materials that provide a high barrier to water vapor and moisture. It is possible to weld by welders clamps giving continuity to the material and allowing a good seal moisture. 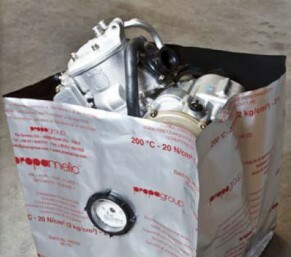 It is advisable to add a desiccant inside welded aluminium bags to ensure moisture-free environments in interior packaging. Rolls of various widths and lengths for custom packaging. Bags and bags tailored according to customer requirements, used either to hedge or to place inside parts, materials or machinery. The welding clamp can work continuously by having the knurled bar, heated by resistances with a thermostat that regulates and maintains the desired temperature, ensuring a hermetic seal. It is a secure and robust product. There is the possibility of joining a moisture indicator to measure indoor humidity on the packaging and controlled from outside. You can also place a valve sealed to facilitate the completion of the internal vacuum. All products are easily welded by the welding clamp.